In his 1967 book The Revolution of Everyday Life, the Belgian Situationist thinker Raoul Vaneigem wondered how much humanity could possibly remain in people “dragged out of sleep at six every morning, jolted about in suburban trains” and “tossed out at the end of the day into the entrance halls of railway stations, those cathedrals of departure for the hell of weekdays and the nugatory paradise of weekends, where the crowd communes in a brutish weariness”. While they might flinch at the unflattering wording, quite a few of the world’s half a billion commuters would surely agree with Vaneigem that the part of the day they spend getting to and returning from work is dead time that simply has to be endured. And yet there is a small but distinguished body of literature about this banal and taken-for-granted routine. I can think of three minor classics – Roger Green’s Notes from Overground, Marc Augé’s In the Metro and Christopher Ross’s Tunnel Visions – that have found a strange, melancholic poetry in the somnambulant iterations and thrown-together community of the daily commute. To this list we can now add Iain Gately’s Rush Hour. It is not as lyrical as these books, nor as personal, although it does begin with him shivering one wintry Monday on platform one at Botley station in Hampshire, waiting for the 07.01 to London Waterloo. But he too finds this daily ritual full of anthropological interest and surreal juxtapositions. Gately’s history starts with the London and Greenwich railway line, opened in 1836 with just under four miles of track and the first line to be used mainly by commuters, and takes us up to the gamechanging possibilities offered by driverless cars and telecommuting. Commuting emerges as a sort of banal, undemanding white noise around which creative things happen. Albert Einstein, we learn, was inspired to wonder whether time might be relative while commuting to work as a patent clerk in Bern and gazing up at the town hall clock from the window of his tram. Gately has a great eye for the illuminating fact that reveals commuting’s capacity to consolidate and synchronise mass behaviour in weird ways. An international urban planning conference in New York in 1898, for example, estimated that the city’s horses, increasing rapidly in number as more were needed to drive the carriages and omnibuses carrying commuters, left 2.5 million pounds of manure on its streets every day and that, if the horse population kept growing at its current rate, manure would fill the city’s streets up to the level of its third-storey windows by 1930. The Times was less alarmist, estimating that London would be only nine feet deep in manure by 1950. 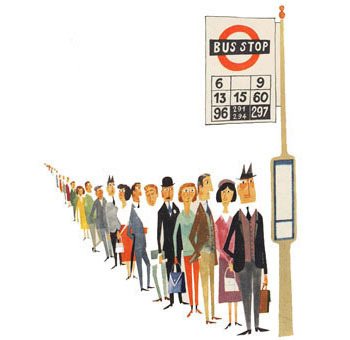 Gately takes us beyond the familiar image of the stockbroker-belt commuter – the famous uniform of briefcase, furled umbrella and bowler hat was, he notes, only common for about thirty years – into the more proletarian city trams and buses where commuting was slower, more congested and more uncomfortable. In the 1950s, Birmingham’s number 8 bus, nicknamed the “Workmen’s Special” because it decanted workers into and out of Ansells Brewery, Saltley gas works and the HP Sauce factory, had its own micro-climate in which, according to one user, “the sweat would run down the inside of the windows, the cigarette smoke was like a London smog and the bus was always bloomin’ freezing”. Throughout most of Asia, including China, the Flying Pigeon has now been supplanted by the Honda C100 Super Cub scooter, introduced in Japan in 1958, still in production and easily the world’s bestselling motor vehicle. Its unique selling points were 19-inch wheels to cope with the heavily potholed Japanese roads and “a step-through profile, so that women could board it without having to hitch up their skirts”. The weaker parts of Rush Hour are where Gately approaches commuting from the outside in, giving us potted, familiar histories of the growth of the railways, the car industry and the suburbs. Mostly, though, he succeeds in unearthing the arcane detail of commuting in order to shed interesting light on these larger issues. Rush Hour reveals how the commute has so often driven social change, from shifting breakfast time to earlier in the day to transforming social etiquette about talking to (or, mostly, ignoring) strangers; and it shows how commuting has inspired new technologies from the car radio to the cheap pocket watch with standardised parts. (According to Gately, Lewis Carroll’s White Rabbit, forever fishing his watch out of his pocket and muttering “Oh dear! Oh dear! I shall be too late!”, is a version of the mid-Victorian commuter neurotically anxious about missing the train.) Commuting is even to blame, he claims, for the Chris Evans Breakfast Show, this “morning zoo” style of radio programme being a product of the commuter’s “diminished ability to focus”. Gately’s contention is that, in spite of the fact that it reduces its victims to daily frustration, discomfort and impotence, commuting also offers them freedom of movement and the chance to improve their lives. Although he does not mention them, his book is a kind of answer to Vaneigem and the Situationists who, witnessing the reconstruction of Paris in the postwar years and the dispersal of workers into the banlieues, defined commuting as worthless, alienated labour. Sometimes, in comparison, Gately’s outlook can feel too sunny. While I do not suggest that he should have provided a Situationist-style critique of commuting or a political economy of it (his book is too much fun for that), he could have dwelled more on how its tedium, like many of the supposedly universal chores of daily life, is unfairly distributed. But this book offers only minor frustrations – appropriately enough, since that, according to Gately, is all that commuting offers as well. Since my trip from home to work desk takes just 20 minutes, I can barely call myself a commuter, but I loved this book’s generosity and curiosity about daily life and the people who find themselves stuck in it. Anyone who does commute would find their journey to work enlivened and enlightened by it.